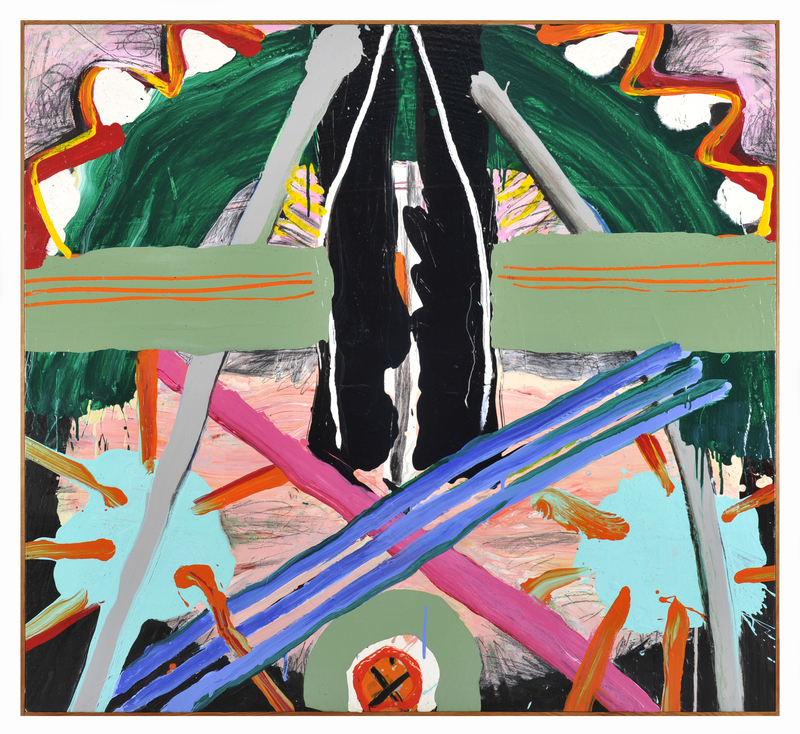 Lucinda Parker is the premier Portland painter of her generation. Lucinda Parker—Force Fields is a 50+ year retrospective at the Hallie Ford Museum in Salem through March 31. Though the year has just started, there is unlikely to be a better or more important painting show in Oregon in 2019. The show begins with two of the artist’s early works. Self-Portrait was painted around 1957 or 1958 when the artist was only 16. A serious looking young woman looks out at the viewer. The brushwork is surprisingly sophisticated for such a young artist but Parker had been taking art lessons since she was in elementary school. In Waterfall at Garland Pond, Putney, Vermont from 1959-1960, actively brushed flowing water foreshadows the dynamism of Parker’s works in the decades to come. The bold colors, dynamic paint (flowing, knifed, brushed), and aggressive scale will come later; these early works are dark, closed, in, and mysterious. 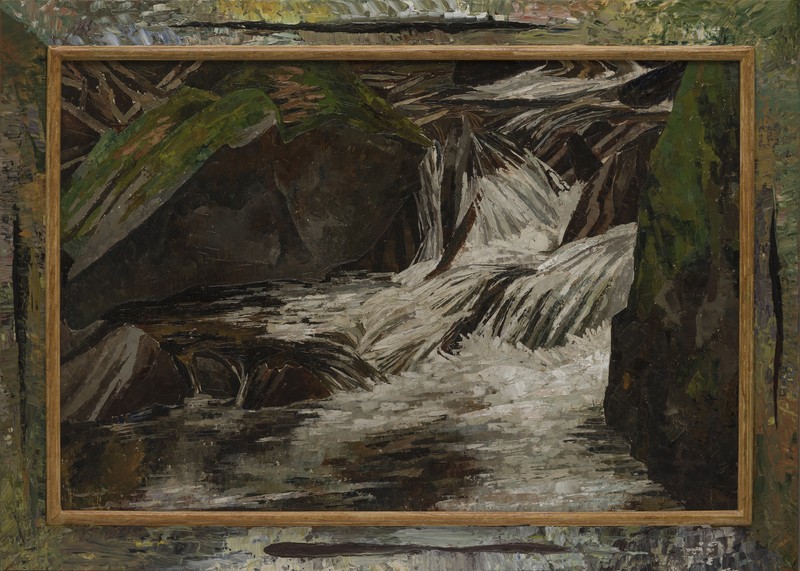 Lucinda Parker, “Waterfall at Garland Point, Putney, Vermont,” (1959-1960), oil on Masonite, with modern frame (acrylic), 30 x 42 in., courtesy of the the artist. Photo: Jim Lommasson. Parker came to Portland in 1960, right after high school at Putney School in Vermont. She was attracted to a combined Reed College/Museum Art School (now PNCA) program. At Reed she, “took my humanities, my chemistry, my French and all that. I got [to the Museum Art School] and I thought it was the best thing in the world to be in a school like that—six hours a day in the studio every day. At night you’re tired. You can’t stay up all night.” She studied with (among others) Mike Russo, Mel Katz, Harry Widman, George Johanson, Dorothy Yezerski, and Louis Bunce. After completing her undergraduate degree program, she went on to get an MFA at Pratt Institute in New York, returning to Portland in 1969. I met Lucinda Parker in the early ’70s when I was a member of the student-run Art Exhibition Committee at Portland State University. Mel Katz was the faculty adviser for the committee and wanted us to do a show of young Portland-area artists. We visited several studios; Parker’s was in the basement of an office building in Northwest Portland. My recollection of her paintings at that time was of hard-edged, overlapping flat shapes. The 1972 show that came from this encounter, Eight New Artists, is one of the first in Parker’s long resume. 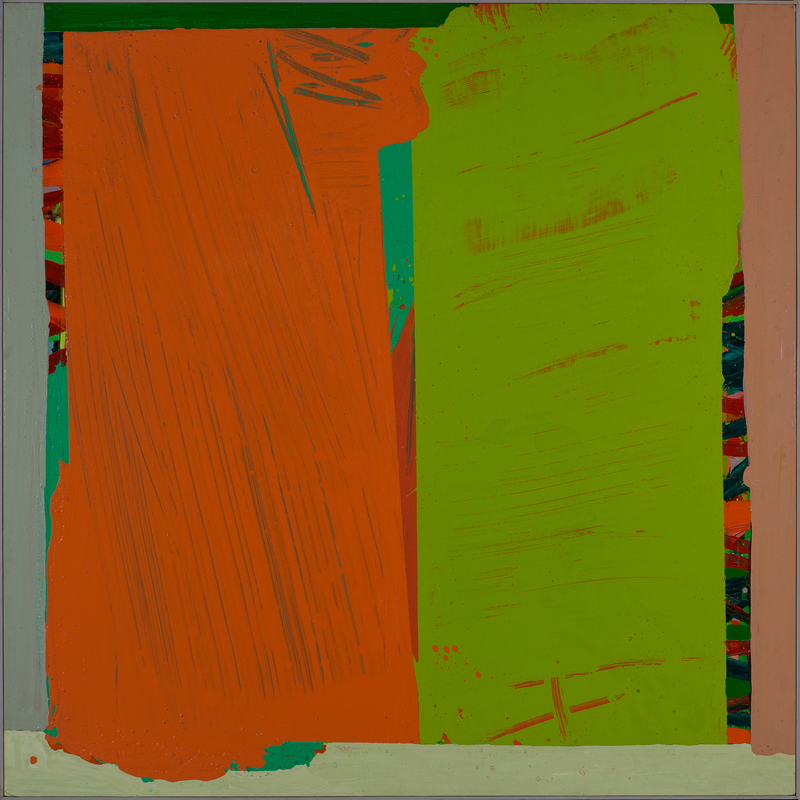 Lucinda Parker, “Pea Green and Salmon,” (1973) acrylic and Rhoplex on canvas (with some taping), 60 3/4 x 60 3/4 in., courtesy of the the artist and Russo Lee Gallery. Photo: Aaron Johanson. The hard edges that I remember from those paintings began to loosen up by the time of Pea Green and Salmon from 1973. It is painted with acrylic and Rhoplex. Rhoplex, an industrial acrylic emulsion paint binder, was the key to a lot of painting’s evolution in the early 1970s. Available in 50 gallon drums, Rhoplex could be mixed with paint so that big fields of color could be poured onto the canvas. In Pea Green and Salmon it looks as though some clean edges were made in the two large color fields using masking tape but in other areas the paint was allowed to flow loosely. Lively brushed fields of color peek around the edges from below the two big shapes. The work reveals the spirit of the time: the hard-edge abstraction of the 1960s (with shapes and compositions calling to mind the work of Parker’s teachers, Louis Bunce and Mel Katz) and then the large fields of poured color associated with the lineage from Helen Frankenthaler through Larry Poons. But Parker soon branches into a new phase in which her work isn’t reminiscent of anyone else’s. By 1974, all the hard edges have disappeared and the anonymous color fields have become definite, albeit loosely painted, big triangles. The big shapes are there to provide something to organize flurries of paint strokes around. It is as if she went through a phase of rejection of the abstract expressionist roots seen in her BFA thesis project from the mid-60s, first through the smoothly painted shapes of 1969-1970, then through letting poured paint itself find edges and make surfaces. But the gestural impulse eventually returned and the hand, and the arm, maybe even the whole body, is evident in her making of paintings from 1974 onward. There are brushstrokes, trowel marks, sgraffiti through painted areas. There is a lot of action but I don’t think it is the equivalent of the “action painting” of 1950s Abstract Expressionism. Parker speaks of her “stroke by stroke judgment”—implying a process that is slow and methodical. Later in the 1970s star shapes and spirals and other strong big forms become motifs to hang paint on—now it’s Mt. Hood. “My paintings are a collision between gesture and geometry,” she said in 2006, 30 years after the triangles show up. Parker is quoted throughout the exhibition catalog. She clearly verbally expresses her philosophy of painting, revealing the importance of her education before, during, and after Reed College. Lucinda Parker, “Star (in the Winner’s Circle),” (1979) acrylic on canvas, 44 x 48 in., collection of the Hallie Ford Museum of Art, Willamette University, Salem, OR, Gift of Marilyn and Robert Shotola, 2008.047. Photo: Dale Peterson. There are about 40 paintings in this exhibition of over 50 years of career. The works illustrate a clear straightforward evolution of thinking about painting through the making of the paintings themselves, and thinking about them later, not by deciding on a strategy beforehand, or by following the whims of style. For me she just becomes more knowledgeable about her enterprise and her paintings become more compelling as time goes by. 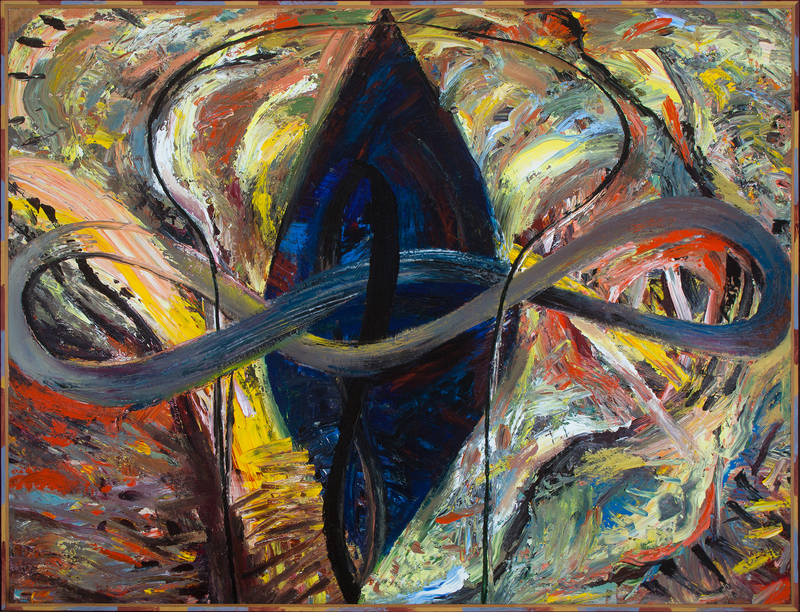 In Cythera’s Gift (1985) the painting is organized around a central motif that combines vertical and horizontal elements: the dark vertically oriented rounded lozenge intersects with an overlapping double twisting infinity symbol that spreads from side-to-side. Behind these features is a torrent of paint activity: sometimes flowing along the edges of the shapes, sometimes colliding with them, sometimes dancing around in little isolated incidents. Parker says, “I always felt that meaning rises up through, within, and from behind the way paint goes down, the way darks and lights slide past each other, and from the overall juggling of balance and tension in the composition. I think of this process as corralling bundles of energy and setting them beside other bundles. I’m looking for a surprising amalgamation of working the surface, shifting, repainting, tilting, overlapping forms, employing volume and space and motion.” By this point her paintings feel symphonic with loud and soft passages, little moments, big crescendos. Lucinda Parker, “Cythera’s Gift,” (1985) acrylic on canvas, 60 x 78 in., collection of Jim and Susan Winkler. Photo: Aaron Johanson. As time goes by Parker’s rounded lozenges become helixes with snakey heads or fishlike forms with tails as seen in River Song (1990), her mural at the Oregon Convention Center. Parker said of those fish shapes, at the time of River Song, “To me, fish were still abstract painting. I could make the shape or color anywhere in a painting of a fish and I could put it or I wanted. And I had no constraints.” The painter decides not to resist hints of representation, but the main content of the painting is still the painting of the painting. 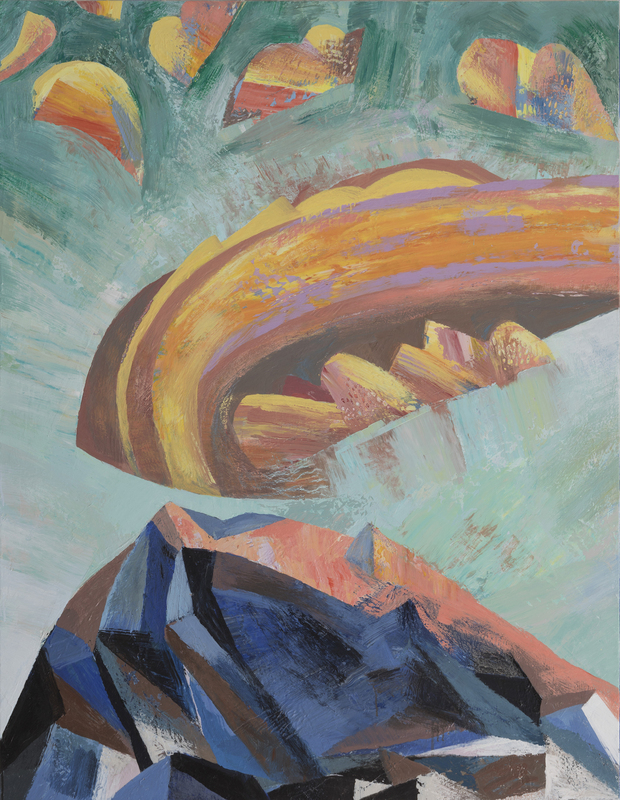 Lucinda Parker, “Pinkish Lenticular,” (2017) acrylic on canvas, 62 x 48 in., courtesy of the artist and Linda Hodges Gallery. Photo: Jim Lommasson. This is an exhibition chock full of all the stuff a strong painter gains over a lifetime. For those unfamiliar with Parker’s work this is a stunning introduction. For me, seeing her work over almost 50 years, it provides frequent reminders of the periods that I’d forgotten. I highly recommend the exhibition catalog, written by Roger Hull. He examines a multitude of ways to consider Parker’s work and her career (as he did with the Louis Bunce catalog/exhibition that he provided a couple years ago). If you can read the book before seeing the exhibition, I believe you will have a much deeper understanding of what you’ll see, why and how it came about, and how the very quotable artist thinks. She is so quotable in fact, that the end of the book has four pages of extra quotes. Talking with Hull when I saw the exhibition, I found out that he believes that, at age 75, this project is his swan song. Congratulations to Roger on his great accomplishment and to Parker on her inimitable career! Coming up: Lucinda Parker, Snow and Ice: Coin of the Realm, February 7 – March 2, 2019, Russo Lee Gallery: (From the press release) Guiding this body of the work, is Parker’s question, “What is of the most value in the Northwest?” She concludes that it is snow and ice, which changes its own shape, and that of the land it touches, as it provides pristine water in an increasingly limited supply. Parker’s latest images continue to explore the Northwest’s mountainous landscapes and what shapes them. She builds energetic forms in a thousand shades of white, combined with exuberant color, from small, intimate gouaches to large scale works on canvas.